It is a lucky cook who is able to pluck a few fresh sprouts from a nearby herb plant to spice up a dish on the stove. Here are a few fabulous herbs that do well in drought tolerant gardens. Fall is a perfect time to plant them, so get out there already! Here are a few posts you may have missed featuring herbs for Southern California or other arid gardens. All three are perennial natives of the Mediterranean, so they match our western climate well. All grow in part shade to full sun either in the ground or in containers. Height: Up to 6 feet, but usually shorter, varieties are either upright or trailing. Flowers: Winter and early spring, usually blue, but white and pink varieties can be found. Rosemary has deep green, fragrant, leaves like pine needles. Mature rosemary branches have an interesting thin papery covering that looks like peeling bark. In Victorian times, rosemary was used as a symbol of remembrance and carried by brides on their wedding day. Cooking with Rosemary: Rosemary tastes good with meat, in soups or stews or with vegetables either fresh or dried. Cut whole branches for stuffing into chickens or turkey. Save a few branches to put around your finished bird on the carving plate. Bruise a few springs of rosemary and place them in olive oil or melted butter for dipping with French bread. Layer slices of bread with fresh rosemary, wrap in foil then warm slightly. The essential oils will seep into the bread and the springs can be eaten raw. Rosemary can be used to decorate your dishes; drop a fresh sprig on mashed potatoes, sliced meat dishes or soups and stews. Height: 12 inches tall and up to two feet around. 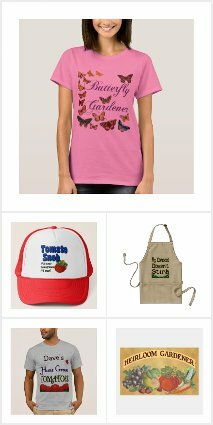 Flowers: In late spring to early summer, in white or pale pink. 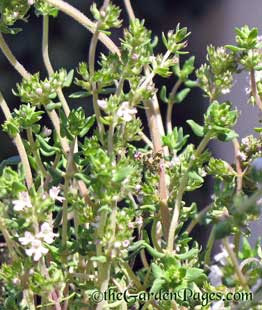 English Thyme is a low-growing small shrub with 1/4 inch long leaves. They make nice groundcovers and also look dramatic spilling over the edge of garden urns. Other varieties are good for use around paving stones where they can be brushed to perfume the air. Other unique aromatic varieties include; cocoanut, lemon, orange and caraway scented thyme. Thyme is a classic ingredient in Medieval knot gardens. In ancient Greece it was used to give courage and to say someone “smelled of thyme” was a rich compliment. Thyme was burned to cleanse and purify temples and is said to be a favorite plant of elves and fairies. Cooking with Thyme: Use thyme either fresh or dried. It goes well with poultry and eggs and adds rich flavor to soups, stews and sauces. Height: Three feet tall and almost as wide. Flowers: In summer with blue or light blue flowers. Culinary Sage is grayish green with square and woody stems. All parts of this plant are aromatic and usually covers with short hairs. 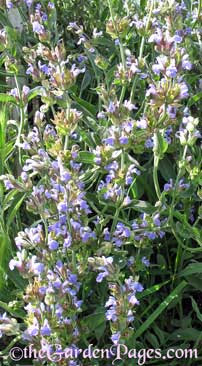 Sage grows in full sun to partial, dappled shade, and are hardy to about 20 degrees. Sage is a beautiful plant in flower, mix a few plants in your flower bed for added color. Sage has been associated with longevity and wisdom since ancient times. It has also been used for blessing and protection, the Romans called it herba sacra, or Holy Herb. Cooking with Sage: Try this hearty herb with beef or chicken. Fresh sage is great stuffed into chicken or turkey roasts and you can use the whole branch. Pineapple sage is a close relative and adds a lighter flavor to food, tasting good with chicken or fish. How To Dry Your Fresh Herbs: Hang them upside down in a cool dry place. Wrap branches with cheesecloth (or paper) or hang branches inside a large paper sack to keep off dust and insects. In a pinch you can just wrap them in paper towels for a few days. Keep dried herbs in airtight containers.